The rise of the internet as a communication tool has resulted in the creation of ehealth interfaces as a service for those with illness. We describe how two online discussion lists for patients with chronic myelogenous leukaemia affect the health care of patients both individually and worldwide. The Chronic Myelogenous Leukaemia International Support Group was formed in 1998 by Robert Neill after his mother was diagnosed as having the condition. The list has 1500 subscribers and averages 28 new postings a day. A major feature of list discussions is the sharing of information and experiences of patients undergoing treatment for disease (figure). In 1999, imatinib (Novartis), a drug in the early phase of clinical trials for chronic myelogenous leukaemia, was in short supply. 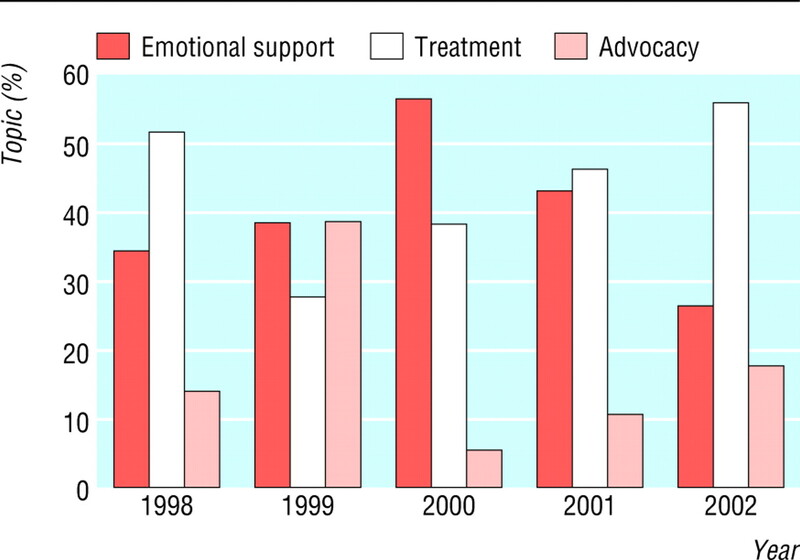 The chronic myelogenous leukaemia list petitioned Novartis to increase production, resulting in the opening of 19 additional clinical trial centres, giving access to patients, many of whom had no other treatment options.1 The sharp rise in advocacy in messages posted on the list in 1999 reflects this mobilisation of patients (figure). This shows how an online support group played a major part in promoting access to treatment. The Asian Chronic Myelogenous Leukaemia Support Group was formed in February 2003 by Anjana Chaudhuri, a care giver based in Singapore, whose husband was diagnosed as having the condition.3 This list has 240 subscribers and averages 34 new postings a day. Most patients (74%) joined the list to obtain information on treatment. All patients thought that their mental wellbeing improved because of the camaraderie from peers. A large proportion viewed the list as a lifeline and a better source of support than family. Most preferred online support to group meetings because of its ability to transcend boundaries of time and geography and to be constantly available. Most (77%) patients reported that knowledge gained from online support groups enabled them to make better decisions about treatment. A major drawback of ehealth applications such as these support groups is their inability to serve as a public health interface on an international scale. Because participation requires internet access and literacy in English, participation from developing countries, with the most serious access problems to medicines, has been limited. The groups, however, are important for increasing both patient education and awareness of global issues affecting treatment. The lists put a human face on access difficulties and hopefully will increase broader advocacy efforts by those in countries where treatment, particularly for cancer, may often be viewed as a personal concern. This new kind of community has potential as a positive aspect of globalisation. The Chronic Myelogenous Leukaemia International Support Group can be found at groups.yahoo.com/group/cml, and the Asian Chronic Myelogenous Leukaemia Support Group can be found at asia.groups.yahoo.com/group/AsianCMLSupportGroup. Contributors ARC conducted the survey and produced the table. All authors wrote the paper. ARC will act as guarantor for the paper.
. Patient power. www.novartis.com/pathways/content/vol2num4/archive/artic2.html (accessed 10 Sep 2003).
. Company's pledge to donate a drug is falling short. New York Times 5 Jun 2003;A1: C11.
. Vital decisions: how internet users decide what information to trust when they or their loved ones are sick, 22 May 2002. www.pewinternet.org/reports/toc.asp?Report=59 (accessed 8 Dec 2003).